Christopher Mark Chandler (born October 12, 1965) is a retired American football player who played as a quarterback in the National Football League for 17 seasons. He is known for leading the Atlanta Falcons to a 14-2 season in 1998, followed up with an appearance in Super Bowl XXXIII. Chandler was born on October 12, 1965, in Everett, Washington. In high school, he was active in basketball, football, track and golf. As a high school quarterback, Chandler threw for 2,000 yards and 49 touchdowns. In college, Chandler played at the University of Washington from 1984 to 1987. He finished third in the school's history in total offense with 4,442 yards and 32 touchdown passes, and ended his college career as the Offensive Player of the Game at the 1988 Senior Bowl. He graduated with an economics degree. Chandler played in the NFL for 17 seasons, from 1988 to 2004. He played for eight teams, a record shared with Mark Royals, Karl Wilson, and Jeff Brady (although Chandler is the only player to have started for eight different teams). He threw for 28,484 yards, and had a career passer rating of 79.1. He has thrown at least one touchdown pass for seven different franchises, an NFL record. At the time of his retirement, he was ranked 30th in all-time pass completions, with 2328. He was continually bothered by injuries, which earned him the moniker of "Crystal Chandelier" amongst his detractors. Chandler was taken in the third round of the draft by the Indianapolis Colts. The Colts deemed Chandler expendable due to his poor play, and the fact that they selected Jeff George with the first overall choice in the 1990 draft. Chandler was traded to the Tampa Bay Buccaneers in 1990 for a 1st round draft choice that turned out to be the 2nd overall pick (The Colts also had the 1st pick the same year. The pick that they got for Chandler they used on Quentin Coryatt). Chandler was cut during the 1991 season. As a Buccaneer, he had an 0-6 record as a starter, threw for 5 touchdowns and 14 interceptions, and had a passer rating of 44.9. From 1992 to 1994 he played reasonably well as a starter and backup for the Phoenix Cardinals and the Los Angeles Rams. After joining the Houston Oilers in 1995, he would earn the starting job. His highlight with the team came on September 24, 1995 at Cincinnati. In the Oilers' 38-28 victory Chandler threw for 352 yards and 4 touchdowns, and earned a perfect passer rating of 158.3 after completing 23 of 26 passes. However, late in 1996, Jeff Fisher decided that Steve McNair was ready to start, and Chandler was traded to the Atlanta Falcons for a fourth-round draft choice. Chandler's best seasons were with Atlanta, when he was coached by Dan Reeves. Chandler was a Pro Bowl quarterback in 1997 and 1998. The 1998 season saw Chandler lead the Falcons to their only Super Bowl appearance, though Atlanta lost to John Elway and the Denver Broncos (coached by Mike Shanahan). In 1998, Chandler's 9.65 yards-per-attempt figure was the highest single-season YPA of any quarterback in the 1990s with 300+ passing attempts. Following the 2000 season, Chandler's record as a starting Atlanta quarterback was 28-25, which prompted the Falcons to consider recruiting a new quarterback. Atlanta held the fifth overall pick in the 2001 draft, and traded the pick to the San Diego Chargers, along with Tim Dwight, a third round pick in 2001, and a 2002 second round pick (which became Reche Caldwell). In return, Atlanta received the first overall pick in the 2001 draft, which they used to select quarterback Michael Vick. Still, Chandler started most of the 2001 season, but was replaced by Vick in 2002 as the starting quarterback. Due to mediocre play, bloated salary, and being replaced by Vick, the Falcons opted to make Chandler eligible for selection by the Houston Texans in the 2002 Expansion Draft, with hopes of Chandler being picked up by the new team. Chandler left the Falcons ranked third in team history with 13,268 passing yards, but never achieved back-to-back winning seasons. In 2002, Chandler was picked up by the Chicago Bears, and spent two seasons there before rejoining the Rams, who had moved to St. Louis. In his first start as a Ram in 2004, he threw six interceptions, a team record. The following week, his poor play led to coach Mike Martz saying, "It is tragic that, that position [when played by Chandler] holds this team hostage." As a result, Chandler was the first Ram to be released in the off-season, saving St. Louis $665,000 in cap space. Chandler lives in San Diego and was married to Diane Brodie, a former college tennis player at USC and daughter of former San Francisco 49ers quarterback John Brodie. They have three daughters: Ryann, Skye, and Brynn. The couple separated in 2010 and divorced in 2011. They each still live in Del Mar, California in separate residences. Chris just recently got remarried to Chrystal Okada, and they live near San Diego, California. Chandler is a regular competitor at the American Century Championship, the annual competition to determine the best golfers among American sports and entertainment celebrities. 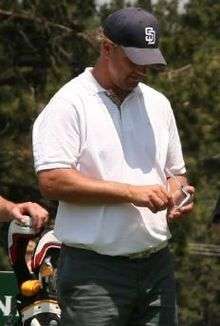 He won the tournament in 2007 and has a total of eight top ten finishes. The tournament, televised by NBC in July, is played at Edgewood Tahoe Golf Course in Lake Tahoe. Chandler helped coach the boys' golf team at Torrey Pines High School, where his oldest daughter Ryann plays on the volleyball team. ↑ "Chandler on Pro-Football-Reference". rbref.com. Retrieved 2007-12-30. ↑ "SI.com". CNN. Retrieved April 28, 2010. ↑ Leonard, Tod (April 22, 2008). "Former NFL quarterback Chris Chandler, now coaching golf at Torrey Pines High, has a strong link to the game". Union-Tribune. ↑ Monahan, Terry (March 21, 2011). "MONAHAN: Torrey Pines' girls' volleyball future in good hands". North County Times.